A few months ago our neighbors moved away. We had gotten to know them only recently, when we were rebuilding after our house fire. That was one of the good things that came out of that hard time. During construction we rented just a few doors down, right next to this nice family. But, alas, they found a house that suited them better. When I drive by their empty house every day, I glance over to check for the for-sale sign and to see if anyone is looking at it. Some days I say a prayer for my old neighbors that they will sell the house quickly and for the new neighbors, whoever they may be. Paul and I talked about how we wanted to make a point to welcome the new neighbors. 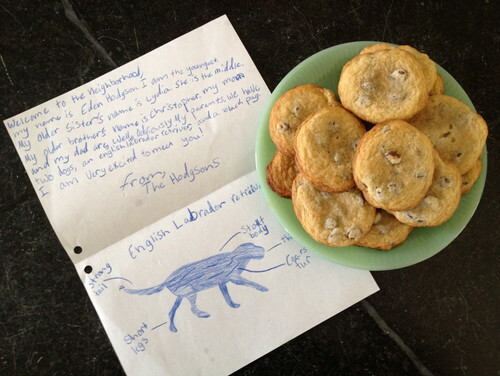 When we moved into our first home, our next-door neighbors brought over a plate of cookies with a note welcoming us to the neighborhood. I had a newborn baby and was trying to get back in shape, so I wasn’t thrilled to be delivered a plate of temptation. 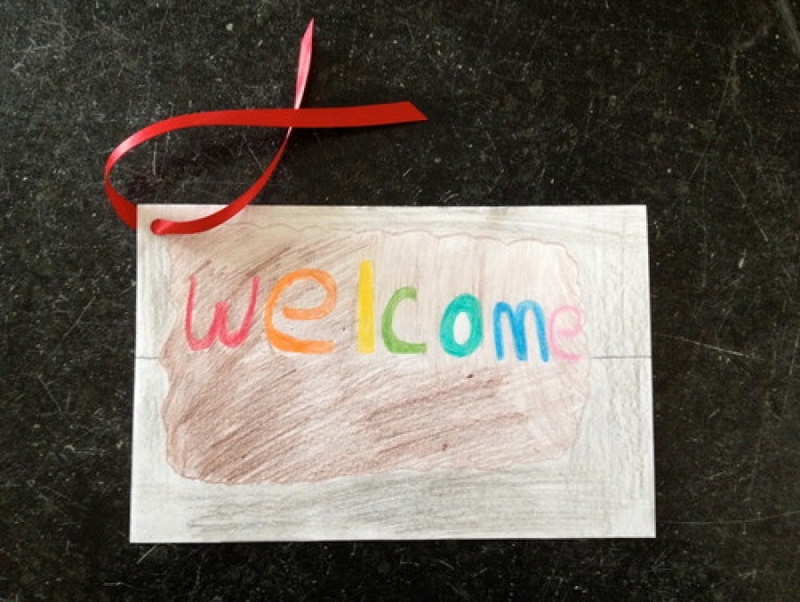 But I was delighted to meet our new neighbors, and their thoughtful gesture had the desired effect. When we bought our second house, there was a gap between the day we took possession and when we actually moved in. We shuttled between the two houses for a few weeks. One day I found a mason jar set by our front door with a simple bouquet and a note from our neighbor up the road. She gave her name and her husband’s, as well as their phone number, and welcomed us to our new home. Last week I drove by our neighbor’s house, and when I did my reflexive look I didn’t see the for-sale sign. A few days later I drove by and saw cars in the driveway and all the lights on in the house. It was clear someone was moving in. I told Paul the next day, “I think I’ll make cookies and write down our name and numbers. We can walk over and introduce ourselves later this afternoon.” He thought that was a great idea. Eden heard us and asked if she could please, oh please, make the card. There was no question of us saying anything but yes. She and I set to work. The cookies didn’t turn out the best. The first batch was slightly undercooked, and the second was half burned. (I hate my new oven!) The third batch was inedible. In general I consider “It’s the thought that counts!” shabby thinking and simple excuse making. If you’re going to do something for someone, you should do it well. And yet too often I’ve failed to make a kind gesture because I’m concerned it won’t be perfect. I mean, what if the family eschews white flour and refined sugar? What if? I’m done with that sort of worrying. The first batch I left on the cookie sheet, and they continued to bake. They weren’t pretty, but I knew they would taste good. Eden’s card, of course, is fantastic. I’m only going to add a small card listing our names with our home and mobile numbers. I know this isn’t necessary, but I’d like them to know we’re good for a cup of sugar or a tablespoon of garam masala. Eden remembered these little candy boxes I bought last Christmas and never used. She thought they would be perfect, and I agreed. 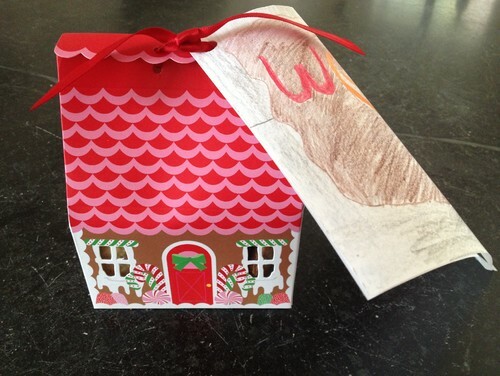 Never mind that it’s a gingerbread house with candy cane trim and this is November. They’re cute and happy, and it’s a little house welcoming our new neighbors to our neighborhood and their home. That’s our thought, and I think it counts more than enough.